As part of our continuing coverage of the so-called "Internet of Things" and Apple HomeKit, Apple World Today recently had the opportunity to do a hands-on review of the ecobee3 lite smart thermostat ($169, affiliate link). This thermostat is a lower-cost alternative to the new ecobee4 smart thermostat with Alexa that was just announced today, and for those who don't want a device "listening" to them all the time, it's perfect. 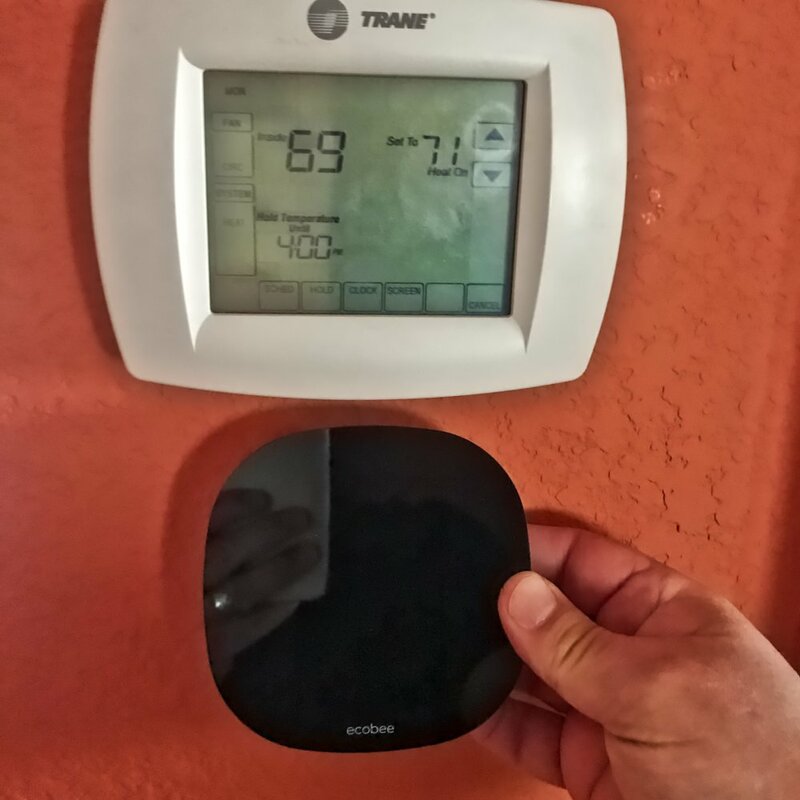 The old thermostat is at top, while the ecobee3 lite is shown below. There is a LOT more intelligence built into the ecobee3 lite. The first thing that hit me about the ecobee3 lite was just how small it was. It's just 4.3 inches (109mm) on a side, and the optional room sensors are even smaller -- just 1.7 inches (44mm) on a side. The display is one of the clearest LCD touchscreens I've seen outside of an Apple product. Even with my bad eyesight, the numbers and settings on the black display are clearly visible from across a room. The display responds to the proximity of a human by changing from a simple room temperature and weather display to the control input display. Walk up to the thermostat and it knows you're there. One thing that you'll need to know before buying one of the ecobee3 lite thermostats is whether or not your heating/cooling system is compatible. Mine was, but since all previous thermostats were either analog (original) or digital (used a 9-volt battery), there was no power to the thermostat. No problem, since ecobee includes a PEK (Power Extension Kit) with the thermostat. This allows you to power the thermostat from your house circuits; no batteries to replace! The white backplate behind the thermostat is included and hides old screw holes and unpainted areas. ecobee also includes a white circular backplate that can be installed if -- like in my case -- removing the old thermostat reveals unpainted areas or screw holes. I've seen third-party backplates on Amazon that can be used with the ecobee3 lite to match your decor. ecobee obviously fixates on design, and this thermostat is worthy of Jony Ive's praise: it's a very "Apple-looking" product that looks perfect in any room. I am the type of person who can screw up almost any type of self-installation. Seriously, I almost caught our house on fire one time when I installed a new hanging lamp in our kitchen... So I was a bit dubious that I was going to install the ecobee3 lite successfully without a lot of cussing and electrical shocks. Fortunately, I was wrong! The step-by-step instructions included were extremely clear and well-written, making a distinction between the really fast installation on systems that don't require the PEK and the slightly more complicated installation process for those that do. ecobee includes small wire tags that are used to mark the various wires before you detach them from the furnace terminal board. All I needed to know was how to turn off the power to my furnace and handle a slot-end screwdriver. The PEK -- which not everyone will need to install -- was very easy to install. ecobee has you mark individual wires before unplugging them from your furnace, and then those wires are simply inserted into the PEK which "grabs" them firmly. Once the PDK is connected to the old furnace wiring, the wires from the PEK are attached to the terminals in the furnace and you're ready to roll. The Power Extension Kit (included) allows older thermostat wiring to support the ecobee3 lite. The next step was to install the thermostat on the wall. Once again, the process was clearly detailed. If you don't like reading instructions, that's not a problem -- ecobee has videos available online. You basically attach the thermostat wires to a set of terminals on the backplate, then snap the ecobee onto the backplate. At this point, I turned on the power again and was greeted with a startup display on the thermostat. Now the thermostat pretty much takes over, asking questions and helping to connect any of the tiny optional room sensors. Those room sensors are a brilliant idea as they determine whether or not a room is occupied, and set the temperature for the occupied room. They can be purchased in a 2-pack for $79 and I think they're definitely worth the money. For Apple HomeKit fans, you'll love the way that the ecobee3 lite prompts you through connecting the thermostat to your "home". It was one of the most painless HomeKit setups I've ever done, and when you consider that the usual HomeKit setups are pretty easy, that means that it took no time and effort to connect to HomeKit. I've had the ecobee3 heating our home for over a week now, and here's a big difference in how ecobee3 lite heats our home. Our old thermostat would just crank up the fan and blow hot air for a while, then the house would cool down and it would kick in again. I'm not sure how the ecobee3 lite does it, but our furnace is running less often now while maintaining a very even heat. I can hear the furnace start up, then go to an intermediate "stage" that isn't as loud or "windy" as what our old thermostat gave us. So we get more quiet and the house seems warmer at the same thermostat setting. The iPhone/iPad app is really well done. At its most basic, it shows you the existing setting on the actual thermostat. You can make quick changes -- tap a button to show that "I'm home" or "I'm away", and the thermostat knows how to react to that. I love that I can add reminders to clean my electronic air cleaner filters, something I always used to forget. There's a vacation mode to keep the house a little cooler in winter or warmer in summer when you're not around, a local weather panel, and so on. It was fairly simple to set the schedule, although I found the method of "copying" settings from another date to be kind of weird. I haven't had the ecobee3 lite long enough to get the Home IQ efficiency reports, but I look forward to that. I do look at the System Monitor, which is why I became aware of how infrequently our furnace is now running while still keeping the house nice and warm. Oh, yeah - I almost forgot about Siri. If you're an Apple user, ecobee3 lite works very well with Apple HomeKit and you can use Siri to change settings. Awesome! Oh, and there's a nice Apple Watch app that can be used to monitor the existing home temperature and the temperature at any sensors you have set up. With a few taps, you can even change the set points of the thermostat. Siri works very well with the thermostat, although I could not get Apple's AI to understand what I meant by "run the fan". I could check the temperature at each sensor and even change the thermostat setting through voice control. One thing I really like about the HomeKit integration is being able to do things like have the thermostat go to a more energy efficient "away" mode when I'm not at home by using geofencing to determine that I'm no longer at the home address. The ecobee3 lite is tiny with a beautiful design, and should fit into any modern home. I have no doubt after a week that it will save us money on heating and cooling based on the smart algorithms it uses to determine how to keep the climate controlled in my home. Installation was a snap, and I love the Siri integration. All in all, I would have paid for the ecobee3 lite even though I didn't, and at $169 (less sensors) it's a bargain.